After emerging as one of the biggest hits in Tamil cinema last year, Raja Rani has now repeated the success act in neighboring Andhra too, when it released in its dubbed version last week on March 14th. A press statement says that the movie collected 4 crores in its opening weekend. The word of mouth for the film is decent and Raja Rani joins the list of Tamil hits which have repeated their success in Andhra too. Fox Star Studios released Raja Rani directly in Andhra and they must be feeling vindicated now. The film opened well in the cities particularly and the Holi holiday on 17th boosted its collections. 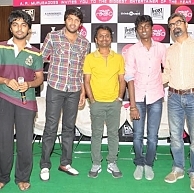 A success meet was held in Hyderabad with co-producer A.R.Murugadoss, hero Arya, director Atlee and composer G.V.Prakash in attendance. Atlee is reportedly getting a lot of good offers in the Telugu industry too and Arya's market in Andhra has received a shot in the arm now thanks to Raja Rani. Kudos to the Raja Rani team for their continued success. Jai Talks About His Character In Raja Rani And About His Passion. People looking for online information on A R Murugadoss, Arya, Atlee, G V Prakash, Raja Rani will find this news story useful.